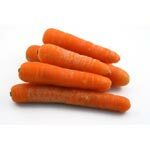 My Child Has Allergy To Carrots – What Should I Do? If your child has an allergy to carrots, there is something that you can do other than to avoid this food altogether. Carrots are frequently used by major food manufacturers as filler. Foods such as spaghetti sauce, baby food and even some meats contain a substantial amount of carrots.